A power couple indeed, Chief Roy and Dr. Janette Kurban are public servants in law enforcement and chiropractic medicine. Their desire to see people empowered to protect themselves stems from their personal passions in the martial arts where Roy is a 9th degree black belt and Janette a 5th degree. Having endured growing up in a home where her parents were abusive to each other and thereby to her and her two brothers, Janette feels blessed to have survived with the help of her church family and able to thrive after years filled with dysfunction and abusive behaviors. Together they provide insights on how to keep yourself from being a victim and recognizing abusive behaviors in others. Retired NFL cornerback Chris Johnson, and his wife Mioshi, know firsthand the pain of losing a family member to domestic violence. Chris’ sister Jennifer Johnson was shot and killed by her ex-boyfriend in 2011. It was through that experience that they realized the importance of educating others on how to recognize the signs of abuse and how to find resources. As advocates to end domestic violence, the Johnsons have appeared on Dr. Phil, CNN and The Today Show. They also serve as board members for the Dallas-Fort Worth non-profit organization, Women Called Moses, which provides support for abused women and children. 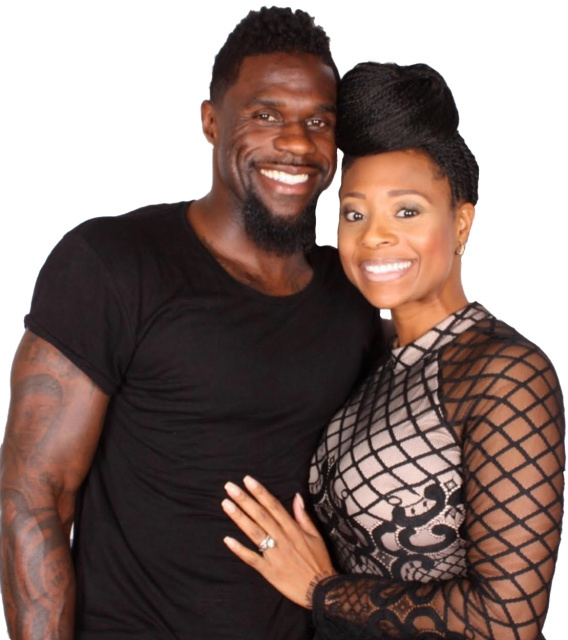 The Johnsons are well-known philanthropists and are always looking to serve and give back to their community. Krystal Smith is no ordinary woman. She lives, breathes and dreams of being true to her higher self, using this as an inspiration to young women and a source for positive change in their lives. In 2008, Krystal experienced an abrupt life change when she was faced with divorce. After living with an abundance of anger, disappointment, hurt and betrayal, feeling both unloved and a failure, she recognized a need for special support that was not available in her time of need. She knew there must be other women facing these same challenges alone, just as she had experienced. This emboldened her to form a sisterhood for struggling young women, which she named BAM (Beautiful Ambitious Me). She is very active in the community, having participated in many outreach programs, volunteers for SWWLS (women against Domestic violence), and is a mental health advocate. Deborah Shields, is a licensed Professional Counselor at The Women’s Center of Tarrant County. A therapist with The Center for 11 years, she works with adult, adolescent and childhood trauma survivors to overcome childhood sexual abuse, sexual assault, domestic violence, and homicide survivors in individual and group settings. She is trained in several different types of therapy including Trauma-focused Cognitive Behavioral Therapy, Cognitive Processing Therapy and Eye Movement Desensitization and Reprocessing. Deborah earned her Master of Arts in Counseling from Dallas Baptist University. Dorothy Patterson, is a survivor of childhood domestic violence. Too often when a child states that they have been violated it is referred to as fondling or inappropriate touching of a child. Seldom, if ever, is it referred to a form of domestic violence. As an innocent little girl, her step-father, the pastor of a church began to teach her of how to look like a little girl, but act like a woman. He never was physically abusive, but sexually and mentally abusive. The mental scars of madness left within her sparked many years of living a silent lie of happiness when she was truly sad and mentally confused. It was not until she began to share her abuse with others did she find the strength to see "The Beauty within the Beast" of her journey to restoration. Born in Los Angeles California and brought up in a primarily Spanish speaking family, GSpook lived in the hood around a lot of gang activity so his mother made him stay in the house so he wouldn't get in trouble. His experience with abuse came from his mother as a child who was being abused by his birth father. Unaware she was being abused, his mother would release her anger on him his brother. As an adult, he experienced intimate partner violence with a girlfriend who verbally abused me and slapped him. He pushed her on a bed and felt overwhelmingly guilty and she wasn't even hurt. He vows that his children will never know any form of abuse from a parent and able to acknowledge abusive signs in a relationship. Teresa Hawley-Howard is an international best-selling author and publisher. Her mission in life is to help others find their voices and share their stories! She also wants to help them walk through their pain, limitations, and their own doubt to live the life they deserve. She knows their words, stories, scars, and their pain can inspire, heal and give hope to another person. She is an empowerment/writing coach, publisher, speaker, #1 international best-selling author, radio host, and CASA volunteer. Chianti is a recording artist from Marshall, Texas. His musical talent began at a young age with a home full of music and talent. Chianti grew up in a home where domestic violence was the norm. He witnessed as a young child, violence between his mother and father. Exposed to the street life by his father and music from his older brother, Chianti quickly learned survival and his ultimate therapy was creating something that burned on the inside of him and being able to let it out with music. Realizing and knowing that family is always first, Chianti advocates that you can come back from anything. Kierra Patterson has a personal story that resonates with so many living in abusive relationships because it all started like a fairytale. Having met her ex when she was returning to work after having my second child, he was Prince Charming providing everything she could want. Months into it the relationship, he started to change, first with verbal name calling and belittling then physical hits. She experienced the inaction of the police because they had no sympathy for a woman not willing to leave the abusive situation. She experienced the familiar trends of being on a time limit and not allowed to hang with friends or family. By the time I she got up the courage to leave, she was in debt, badly damaged and had no self-worth. Now a successful writer and host of Off Tha Chainz, she hopes that her story of survival can save at least one person.